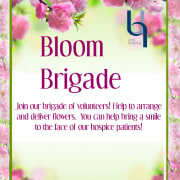 Join the happiest, brightest, most joyful volunteer team around, the Unity Hospice Volunteer Bloom Brigade! We are on a mission to bring color, freshness, and fragrance to our patients who are often confined to plain rooms. We are looking for help with floral arranging, donation pick ups, and delivery. Be part of the team that brings beauty to hospice patients. All of our volunteer hours are flexible based on your availability!